1st item: Neoclassical style Silver basket frame with fixed handle and repousse floral decoration, .800 and additional, unidentified Continental hallmarks. 8 1/2" H. Lacking insert. 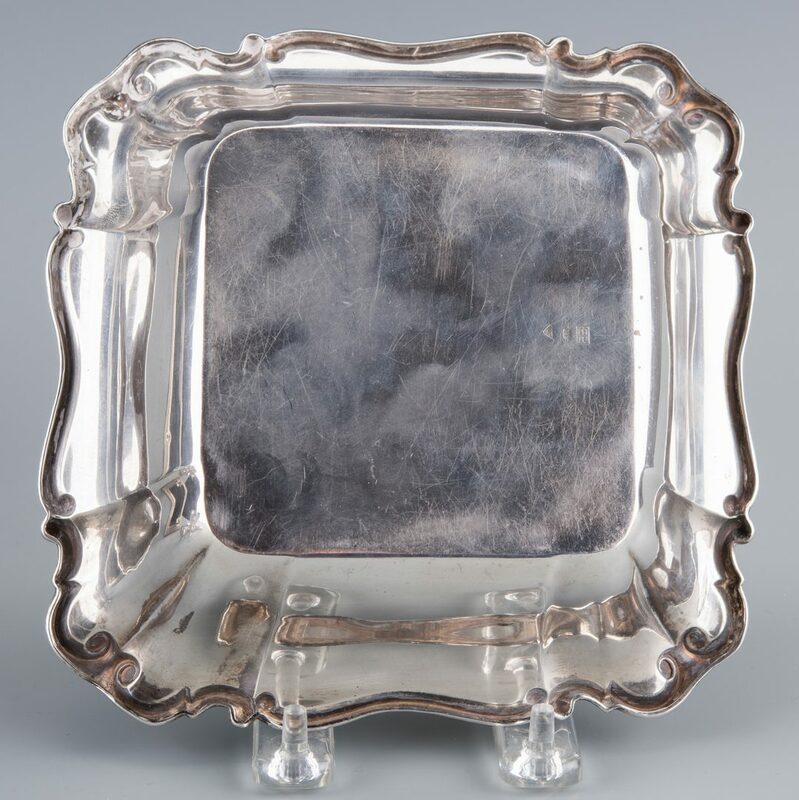 2nd item: Square silver dish with tall, scalloped sides, marked .900 with maker's mark FB, 2" H x 6" square. 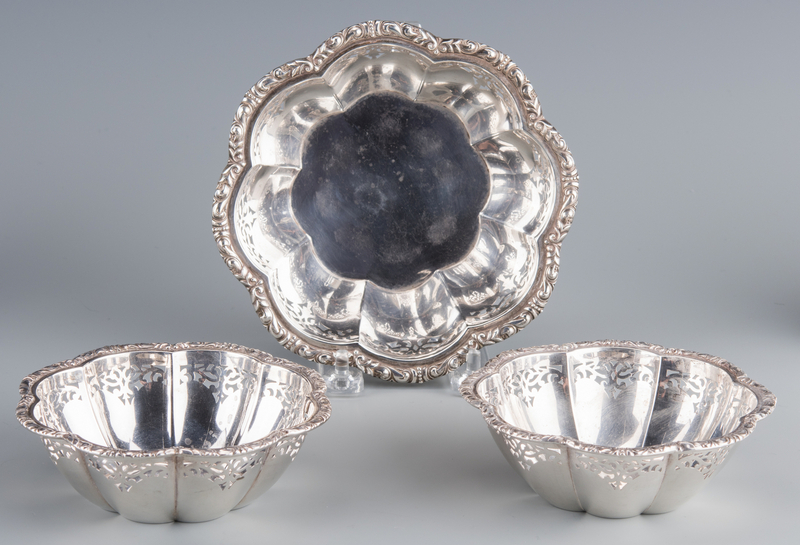 3rd through 5th items: Lobed round bowl with pierced sides, 6" diameter, and two smaller bowls of identical design, 4 1/2" diameter. Marked .900 with maker's mark FB. 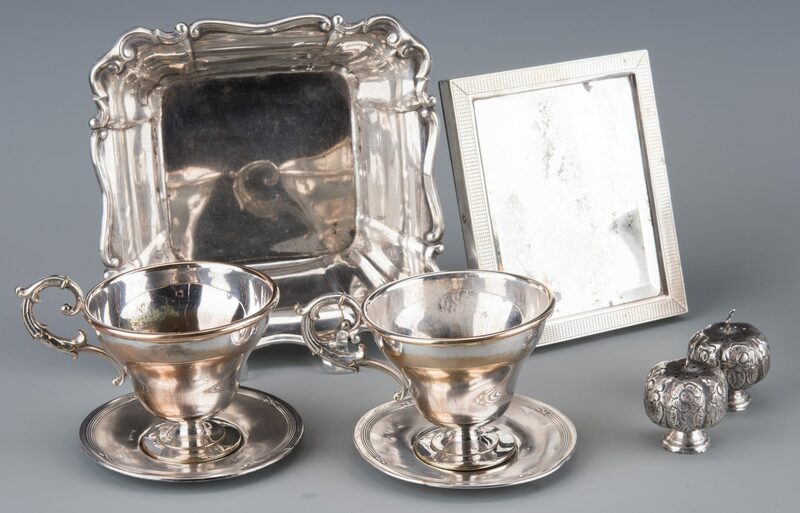 6th and 7th items: 2 teacups with gilt-accented handles, lion rampant marks to undersides (possibly Swiss), also marked H in square and stamped P, 3 1/4" H. 8th and 9th items: Two saucers with Neoclassical style reeded design at edges, marked on face with .800 mark and other illegible marks, possibly Swiss, 4" diameter. Each with several small dents. 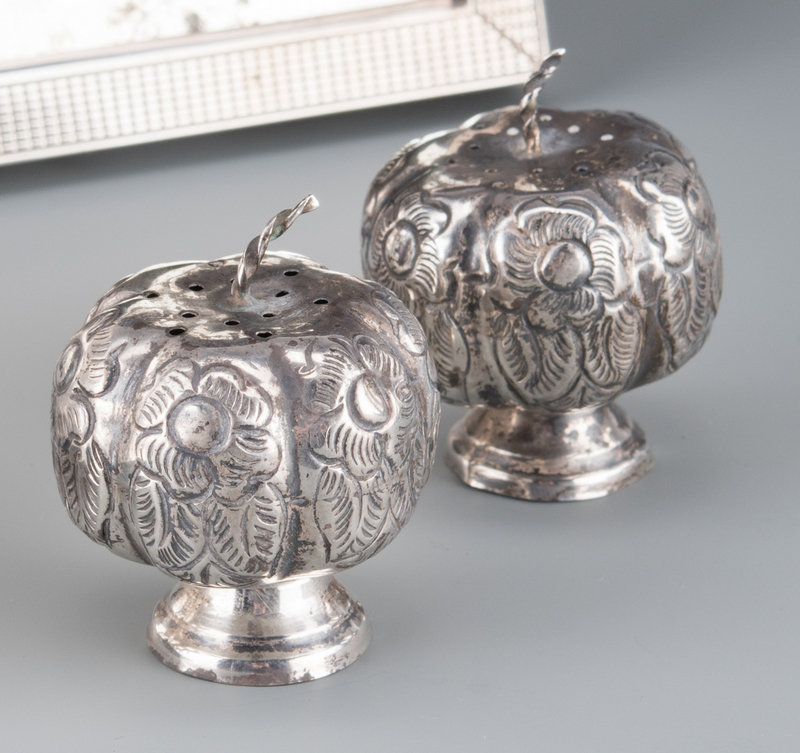 10th and 11th items: Set of salt and pepper shakers, lobed pumpkin style bodies with twisted wire "stems" and engraved floral decoration, set on a raised foot, marked SG Hecho in Mexico 925. 1 5/8" H. Oxidation around holes. 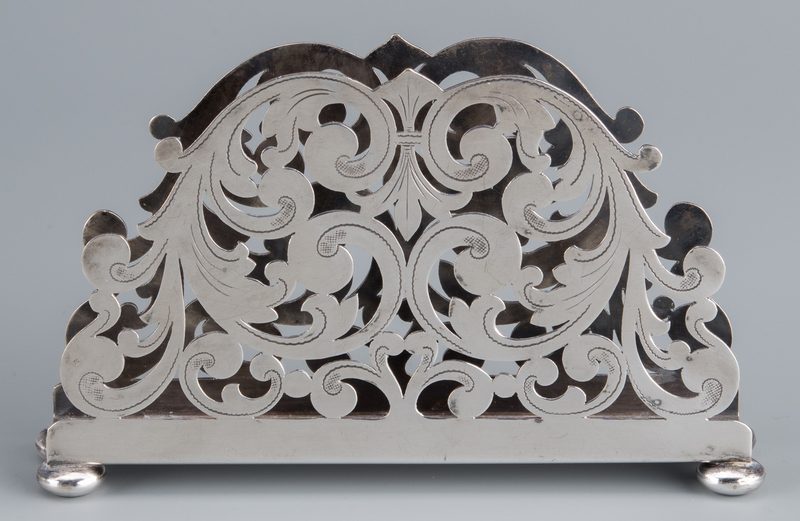 12th item: Art Deco small framed beveled table mirror with rosewood back and grid-lined silver frame, marked .800, 5 1/2" x 4 3/4". 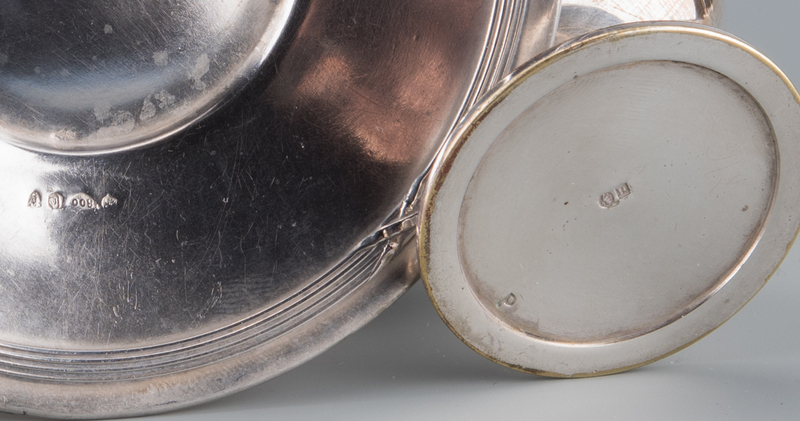 Considerable loss of silvering to mirror, crack to wood on back. 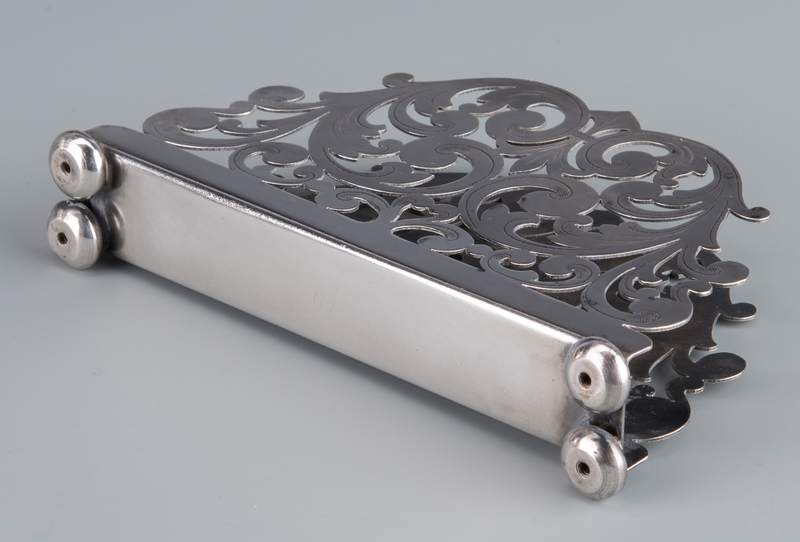 13th item: Pierced scrolled napkin holder on compressed ball feet, unmarked, probably silverplated. 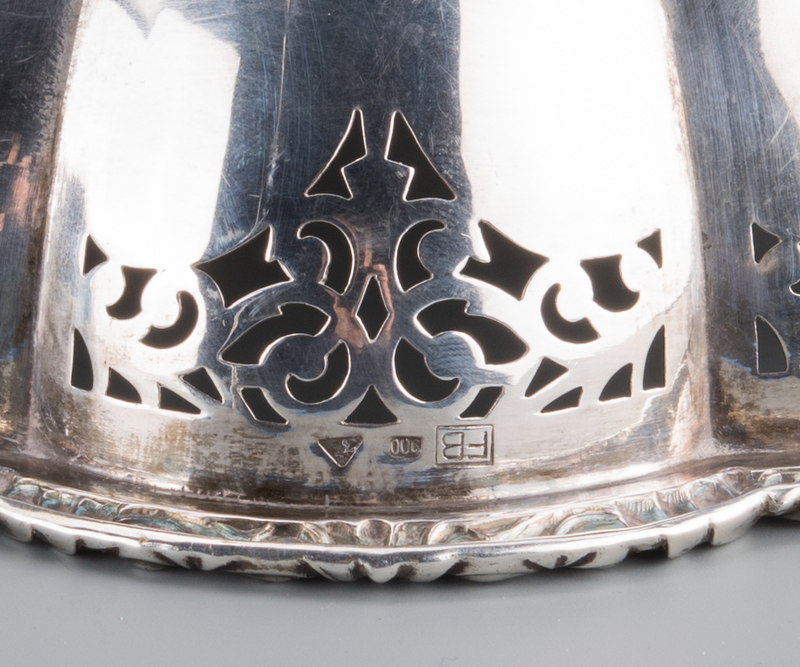 3 3/4" H. Combined weighable marked silver: 35.06 oz troy. CONDITION: All items in very good condition with a few scattered small minor dents except where noted in the above description.